This is my first time reading Avengers World, and I picked it up because of one announcement: Cassie Lang! I loved Young Avengers‘ first volume (2005-2006) and Avengers: The Children’s Crusade (2010-2012), and was brokenhearted when Cassie died. This is also my first time seeing Marco Checchetto and Ramon Rosanas’ art. Wow! Checchetto’s drawing style, complemented by Andres Mossa’s colors, is clean and shaded with incredible detail. An early panel where Valkyrie is slashing Scarlet Witchbots is amazing: look at the crosshatch shading on her forearm and hands. Mossa’s greys and silvers of Valkyrie’s outfit and gauntlets are perfect. Valkyrie was one of my favorite characters in Fearless Defenders, and I’m happy to see her done justice here. 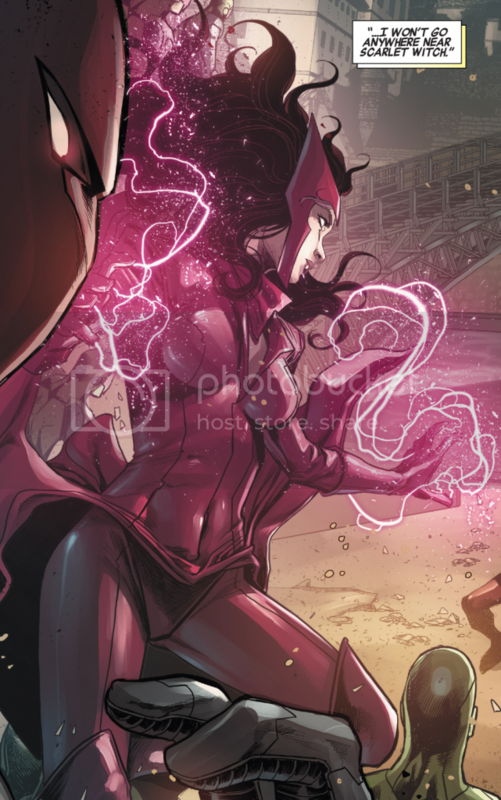 Scarlet Witch is by far the artistic highlight, with cackling magenta chaos magic energy emanating from her hands. Nick Spencer and Frank Barbiere give Stingray some great exposition and a moment of true heroism. Scarlet Witch is actually fascinating as an inverted character, and her icy attitude towards Valeria is fun to read. Spencer and Barbiere pick the perfect opportunity to bring Cassie back, seizing the setup presented by the otherwise innocuous AXIS event. Dialogue throughout is paced well without lags or verbosity. I also like 3-D Man’s laid-back personality and verbal style, and the impressively drawn, blur-motion panel where he speeds to someone’s rescue. I’m impressed with Spencer and Barbiere’s ability to balance the gravitas of Doom and Scarlet Witch’s complex emotions with the innocence of Valeria and 3-D Man. This creative team magnificently tells a concise, compelling story with permanent repercussions in the Marvel Universe. 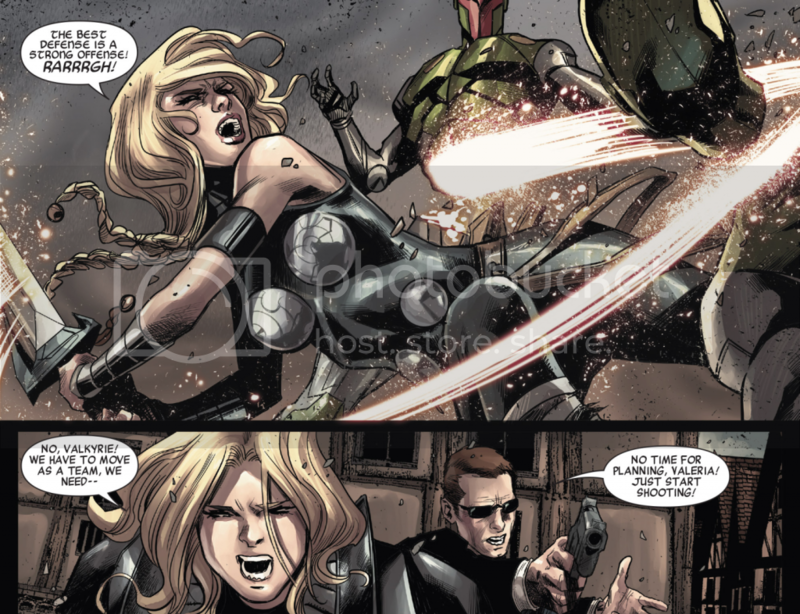 Welcome back, Cassie Lang. This issue is a beautiful backdrop to your return.